This is a pool spa combo built for a family in Beresford Creek Landing. 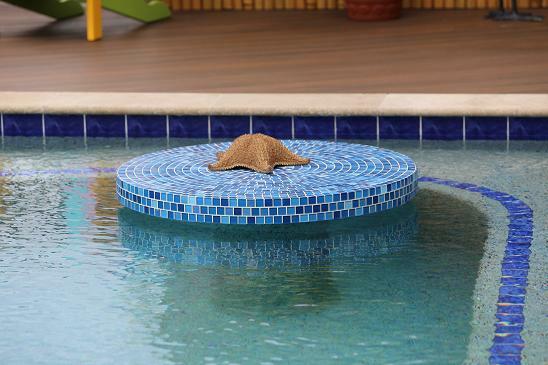 This infinity pool design was built and designed by Aqua Blue Pools. This pool has many features. You can rest an ice-cold beverage on the tiled table which has bench seating surrounding it so you get that cocktail lounge feel in the pool. Infinity pools are known by a variety of different names. They can be called negative edge pools, disappearing edge pools, infinity edge pools and so forth. 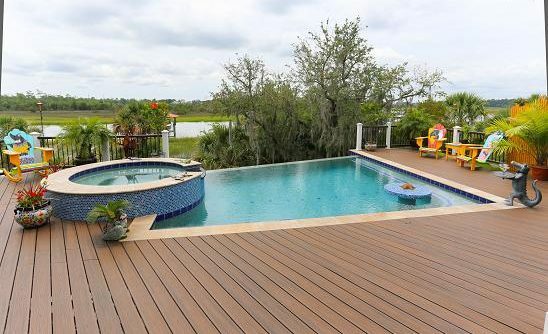 Aqua Blue Pools has been designing and building infinity pools for years and has built and designed some of the best infinity pools along Coastal South Carolina. While it’s difficult to say how much infinity pools cost, one can expect that an infinity pool cost on average can range from $70,000 and go higher. Infinity pool designs continue to be popular with homeowners and this trend doesn’t show any signs of slowing down.